This is a Chic Rho page, which is the monogram for Christ that begins the genealogy in the Christian Gospels. The text reads XPI (Christi) AUTEM GENERATIO... It is done in an 8th century British Isles style in an Irish Christian tradition. This type of illustration was very common and expected in such books of the time, but my page is not a copy of any particular one. 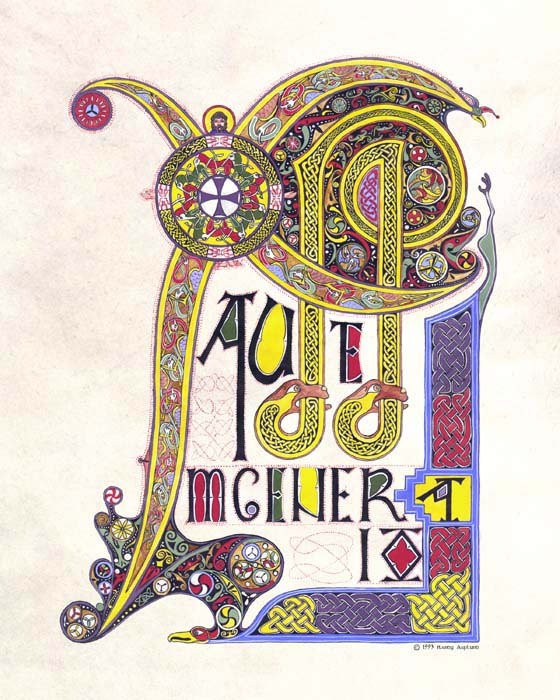 For an example of a similar page, please look up the Book of Kells or the Lindisfarne Gospels.